I have been teaching piano locally since 2001 and have worked with students ranging from pre-kindergarten to retirement, and every life stage in between. My musical journey began at age 6 when my mother gave me a child-sized piano with its own bench, along with an instructional booklet. I sat down, propped the booklet up on the tiny music rack and, before long, was playing the mandatory Mary Had a Little Lamb, Twinkle, Twinkle Little Star and Jingle Bells. By third grade, I was taking formal piano lessons and moving up through the skill levels. Realizing that in addition to music, teaching was one of my life callings, I went on to earn a master's of education from Florida Atlantic University and a certificate of piano performance from ARCID Music Academy. On this website, you'll find details about my lessons and some of my favorite instructional books. I've also included some student recital recordings. Thank you for stopping by. Enjoy! Lessons take place at your home in one-hour or half-hour sessions. I provide comprehensive instruction tailored to each student's age and level. The direction of lessons is driven by his or her unique goals. Students can choose from a variety of materials for each of the five main categories: theory, repertoire, technique, composition and ear training. I strive to present a creative and enjoyable array of written and performed activities that explore music from many perspectives so that students as young as 4 are constantly engaged. The contextual background of music, such as Ode to Joy which was composed as a celebration of the unity of all mankind, is provided in concise mini-lessons to form a complete understanding of the character of each piece. Learning how all of the elements of a given piece of music combine helps students to deliver inspired performances. I understand that things come up, so I allow lessons to be canceled at any time. Canceled lessons may be rescheduled. 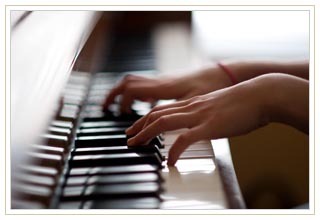 Students will need an acoustic piano, electronic piano or electronic keyboard, as well as a metronome and books. CDs are also helpful but not required. Once lessons have begun, I encourage students to seek supplemental sheet music to add to their repertoire. Please contact me before purchasing lesson materials. The Piano Adventures series is one of the newest and most comprehensive methods available. This method integrates instruction between the theory, technique, and lesson books. The curriculum is designed to tie together technical concepts with visual imagery. Students learn to bring out the character with clear guidance about hand position, theory, and style. Written for ages 5 and 6, My First Piano Adventure captures the child's playful spirit. Fun-filled songs, rhythm games and technique activities develop beginning keyboard skills. Students have the option to participate in a recitals each year. In the spring we have a recital to perform Classical, Folk, and Popular music. Themed recitals for holidays are scheduled during fall or winter. Below are recordings of student recital performances. The musical selections represent a variety of styles. Alex, age 10, has been taking lessons for two years. Lorichama is 6 years old and she has been taking lessons for one year. Taylor, age 7, has been taking lessons for one year. I provide private piano lessons in Boca Raton, Parkland, Coral Springs, Deerfield Beach, Delray Beach, and nearby areas in South Florida.